Working with the Rwenzori Founders team, established British sculptor Jon Buck has researched and designed a series of over thirty Clan Totems based on local traditions and tribal symbols. These include familiar Ugandan animals such as the lion, leopard and elephant as well as less-often seen creatures like the pangolin. 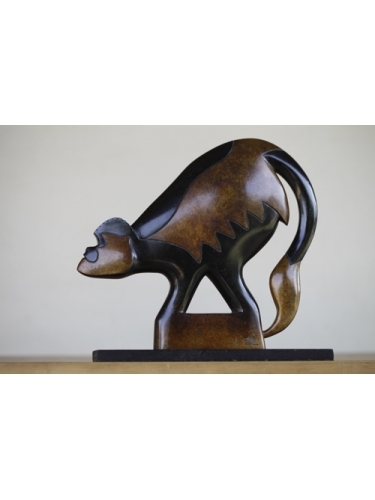 All have been cast into bronze by Rwenzori Founders and a selection is always on show in the on-site gallery. Click here to download our Clan Totem brochure. If you are unable to visit us, Clan Totems are also available from Banana Boat shops in Kampala. As well as the totem series, Jon has recently worked on site with the team to create the largest sculpture to be cast to date. Completed in late 2014, Bird in the Bush is now installed outside the gallery. Click here to see a video of the making of Bird in the Bush.